Happy Tropical Anniversary" is the perfect song to share when your anniversary is being spent in the tropics. 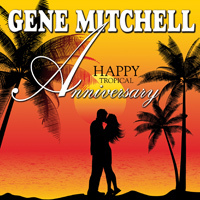 Gene Mitchell has come through again with great melody, lyrics and production for this special subject for all those who enjoy island music, Trop-Rock and just plain feel-good music. "Happy Tropical Anniversary" has been completed for two years; it will appear on a full length CD in 2012. However, we cannot wait to share this special song with everyone - so, we have made it available for download only. Click on the download icon and start enjoying the music, and/or your anniversary - tropical style.